Drain the cherries in a sieve over a bowl, reserving the kirsch. Arrange half of the fingerellas in the base and around the sides of a large trifle dish or glass bowl, and spoon 6 tablespoons of the reserved kirsch over the top. Scatter over half of the cherries. In a separate bowl, whip the mascarpone and cream with the sugar and vanilla until smooth and slightly thickened, then spoon half the mixture over the cherries. Add the remaining fingerellas, spoon over 3 more tablespoons of the kirsch and top with the remaining cherries. Spoon the chocolate custard over and finish with the remaining cream mixture. 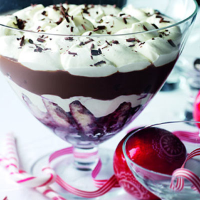 Using a potato peeler, shave the rest of the chocolate over the top of the trifle. Chill until ready to serve. This trifle tastes even better if made in advance, allowing the alcohol to soak into the sponge fingers. Keep covered in the fridge until ready to serve. If you prefer, make 8 individual trifles.